Over the years, many friends have commented that my chicken stir-fries are always juicy, flavoursome and never dry. Just like my mum’s! Growing up we had stir-fried something at least every second night and I consider my mum to be a super wok-cooker. She taught me everything I know about frying in the wok, which is summarised here for your cooking pleasure, along with a delicious and extremely easy recipe for my favourite Honey Chicken. Use chicken thigh fillet, preferably free-range, cut into 1-inch sized pieces. Marinate in soy or a combination of soy and dry sherry/xiao xing rice wine up to 24 hours ahead. Use a tablespoon of liquid per 200 grams. Stir through some cornflour, about 1 tablespoon for every 400 grams, just before cooking. The flour will mix with the soy/sherry/rice wine to create a sticky, almost batter-like coating. Ensure your wok is as hot as possible. My mum used to have a separate wok cooker which ran on bottled gas, and could therefore get better pressure and heat than piped gas. I have a pretty average gas cooktop so I have to wait quite a while in between batches so the wok gets to a decent temperature. Add your oil after the wok is hot, then let it come to ‘shimmering’ before adding the meat. Cook the meat in small batches. I’m talking 100 grams at a time, otherwise the temperature will drop too much. If this happens the meat won’t seal and brown properly, and will end up stewing instead of frying. Don’t stir the meat too much. Let it brown and become slightly crisp before tossing to brown the other sides. Allow the wok to heat up completely prior to adding the next batch. 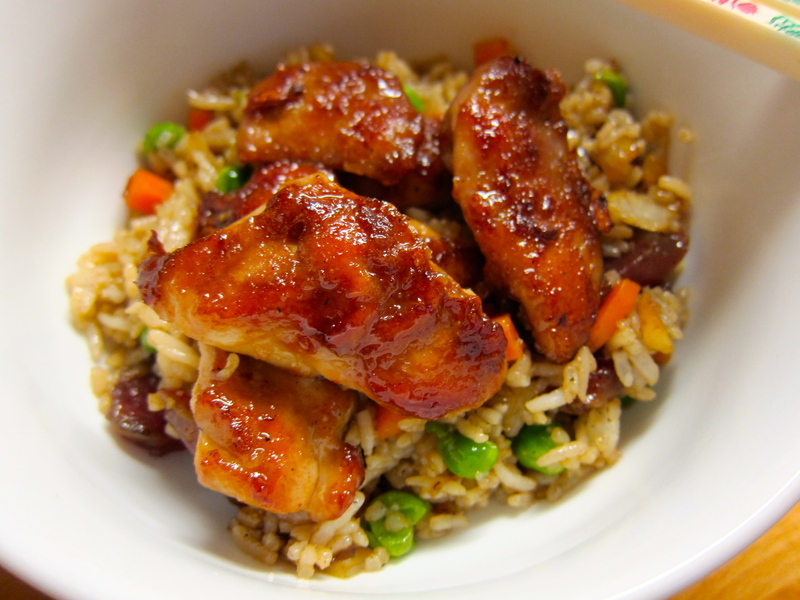 Marinate, prepare and stir-fry chicken in batches as described above. When all the chicken has been cooked and removed from the wok, add a teaspoon of oil and fry the garlic and ginger briefly. Return the chicken pieces to the wok. Pour over the honey. It will bubble up at first, then turn very runny, then begin to caramelise and reduce slightly. When the sauce completely coats the chicken, remove and serve immediately. After making this tonight, Mr Black said that if this were takeaway, it would be the best Chinese takeaway he’d ever had. If you try it, I’d love to hear how it goes! Great stir frying tips! How much honey do you add? Hi David, I add a few tablespoons – maybe 2 or 3. Should be just enough to coat all the chicken, and make a little sauce but not too much.